After a rocky start to the year, most stocks ended the first quarter slightly higher, which is remarkable considering the negative sentiment that caused stocks to selloff in the early weeks of 2016. For the quarter, the S&P 500 gained 0.77%, the Dow grew 1.49%, and the NASDAQ fell 2.75%. Markets faced serious headwinds last quarter due to slowing economic growth around the world. Combined with rising interest rates, a strong dollar, and falling commodities prices, we faced a perfect storm of factors that ticked off a stock market correction. However, after falling by as much as 10.5% earlier in the quarter, the S&P 500 gained 6.8% in March. That's the best performance since October 2015. Given the roller coaster ride we've had this year, the recent gains are a testament to the resilience of investors. Let's talk about what happened last quarter. What affected markets in Q1 2016? Slowing global economic growth. Concerns about overseas growth were responsible for a lot of market activity. China's ongoing economic woes caused major turmoil in markets around the world as investors digested the news that the world's second-largest economy is slowing. Though China is grappling with a transition away from a manufacturing-centered economy, experts fear that the move won't come without pain. Europe also faced its share of concerns. China's slowing demand for foreign goods will hit European firms harder as many worry about terrorism and the migration crisis currently facing the borderless Schengen region. Volatile oil prices. Oil producers faced falling demand and stubbornly high oil supplies, which caused oil prices to plunge. At the end of the quarter, prices appear to have stabilized somewhat as oil-rich nations like Kuwait and Saudi Arabia seek to stabilize prices through cooperation between producers. The volatility and prolonged lows will likely be felt in energy sector earnings for the first quarter; however, low prices were a boon to consumers. Though gasoline prices will likely rise as refineries switch to summer blends ahead of the peak summer driving season, the average cost per gallon hit a 12-year low in the first quarter. The national average for the quarter was $1.86 per gallon-saving Americans nearly $10 billion, or about $45 per licensed driver. Did Americans plow those gas savings back into the economy through spending? We'll see when spending data for the quarter is released. Recession worries. At the beginning of the year, investors became increasingly concerned that global issues could come home to roost in the form of a recession. Though fears of a slowdown are serious, some domestic economic data suggests that a recession may not be nigh. The labor market added 628,000 jobs in the first three months of the year. Other employment factors also improved; the labor force participation rate increased and the number of discouraged workers decreased. Wages also increased 2.25% in March from a year earlier. Consumer spending, which is a significant contributor to U.S. economic growth, also increased, albeit sluggishly. Central bank actions. Markets also responded to decisions by the Federal Reserve, European Central Bank, and Bank of Japan. While the Fed is working to bring interest rates closer to historic averages, the BOJ and ECB are struggling to stoke economic growth by lowering rates into negative territory and buying up assets. The big questions remain: When will the Fed raise rates again? Do central banks have enough bullets left to fight a global slowdown? What's in store for Q2 2016? After the first quarter's wild ride, we can hope for a smoother second quarter. Current estimates peg U.S. economic growth at 0.7% in the first three months of 2016. 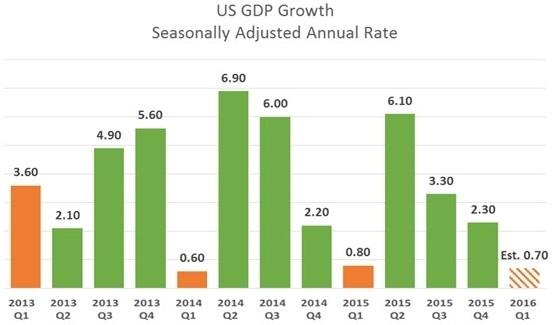 That's a big comedown from the 1.4% growth in the fourth quarter, but it's in line with the slow start the economy has experienced in several of the past few years. Is the economy still at risk of a slowdown? That's very possible, and may depend on how much consumers open their wallets this year. Gross domestic product (GDP) is the monetary value of all the finished goods and services produced within a country's borders in a specific time period, though GDP is usually calculated on an annual basis. It includes all of private and public consumption, government outlays, investments, and exports less imports that occur within a defined territory. Source: Bureau of Economic Analysis and Federal Reserve Bank of St. Louis. What can we look forward to in the second quarter? Well, more uncertainty is certain. Though some fears have abated, most of the headwinds are still with us as we head into the second quarter. However, a lot of the potential pain facing the economy may already be priced into markets, and analysts are considerably more optimistic than they were during the rocky ride in January and February. If first-quarter results show a rosier picture, then investors could react with a resumption of the rally. A lot depends on what the Federal Reserve has in store for interest rates; currently, the odds favor a June hike. Fed Chair Janet Yellen has struck a dovish tone in recent remarks, indicating that she plans to "proceed cautiously." However, the rosy March jobs report could increase the odds of an April rate hike. We'll know more in the coming weeks. Economy adds 215,000 jobs in March. Though the unemployment rate increased to 5.0%, economists view it as a good sign that jobseekers are reentering the market. Motor vehicle sales rise. U.S. car makers expect to have sold 1.66 million autos last month, roughly a 7.0% increase over a year ago. One estimate suggests that carmakers had the best monthly sales in a decade. Consumer sentiment drops slightly. Though one gauge of consumer optimism fell in March, it came in better than economists had expected. The steady pattern suggests that consumers are still fairly optimistic about their finances this year. Construction spending falls. Spending on new construction projects fell in February by the largest amount in three months following a January gain. However, residential construction rose solidly.